13. Once prompted to activate a license key select “Start 14 day free trial”, and begin exploring Alteyrx! If you’re an existing Alteryx client you should already have your very own Alteryx Designer license key. With this key you are able to create yourself an Alteryx account granting you access to the Alteryx Downloads portal. Here you’ll have access to all of the latest (and previous) versions of the Alteryx products that you have purchased. Now that you’ve signed up, you’ll have access to the Downloads & Licenses portal at anytime. 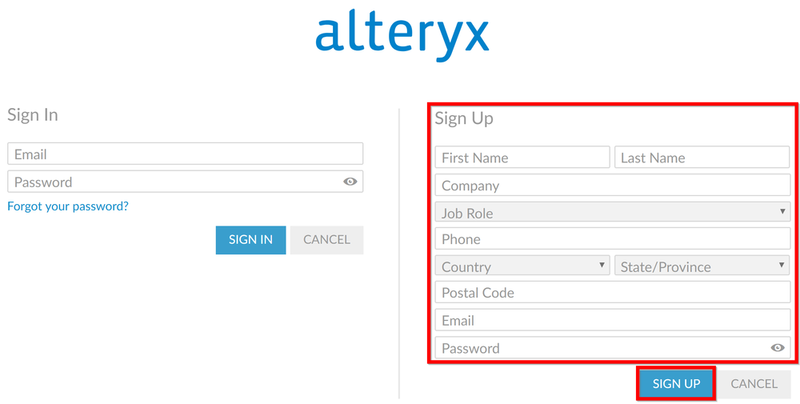 You can get back to this page by navigating to (www.licenses.alteryx.com) and completing the “Sign In” section with your chosen email address and password. 15. Once prompted to activate a license key select “Start 14 day free trial”, and begin exploring Alteryx!